How to Lose Friends & Alienate People is a 2008 British comedy film based upon Toby Young's 2001 memoir How to Lose Friends & Alienate People. The film follows a similar storyline, about his five-year struggle to make it in the United States after employment at Sharps Magazine. The names of the magazine and people Young came into contact with during the time were changed for the film adaptation. The film version (adapted by Peter Straughan) is a highly fictionalized account, and differs greatly from the work upon which it was built. Directed by Robert B. Weide, it stars Simon Pegg, Kirsten Dunst, Danny Huston, Gillian Anderson, Megan Fox and Jeff Bridges, alongside Max Minghella and Margo Stilley. 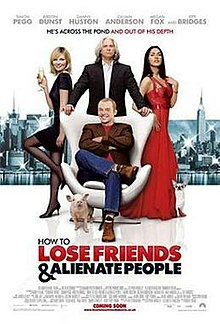 How to Lose Friends & Alienate People was released simultaneously in the United Kingdom (by Paramount Pictures) and the United States (by Metro-Goldwyn-Mayer) on 3 October 2008. Sidney Young, an aspiring British journalist who runs a failing polemical magazine, attempts to infiltrate a party organized by Clayton Harding (Jeff Bridges), the CEO of Sharps, one of the most prestigious magazines in the world. In doing so, he momentarily gains Clayton's sympathy, as the latter began his own career through polemics. Sidney is offered a job at Sharps, and moves to New York City, but he quickly earns the scorn of his colleagues, including Alison Olsen (Kirsten Dunst) and the manager Lawrence Maddox (Danny Huston), as a result of his rudeness, vulgarity, and general unattractiveness. He discovers that interviews with famous performers must be arranged by an influential publicist named Eleanor Johnson (Gillian Anderson), who imposes restrictions on published content, which offends Sidney, since he enjoys writing polemics. On one occasion, Sidney accidentally kills the dog of a rising actress named Sophie Maes (Megan Fox), to whom Sidney is intensely sexually attracted. To his fortune, Alison, who despises Sidney, agrees to help him conceal the mistake. Sidney gains Alison's respect by explaining his disapproval of Eleanor's practices, and Alison reveals that she also despises her job, and has been working sporadically on a novel for years, which she hopes to publish. At a party, Sidney discovers that Alison was having an affair with Lawrence, but has chosen to end it. He is approached by Sophie, who has become drunk, but forfeits the chance to sleep with her, upon discovering that Alison is also drunk and needs to be driven. At his apartment, Alison meets Sidney's father, who turns out to be a well known philosophy professor, and a member of the nobility. Later, Sidney attempts to ask Alison on a date, but learns that she is reuniting with Lawrence, who has just divorced his wife, who is Clayton's daughter. Being heavily depressed, Sidney compromises his journalistic principles and begs to work with Eleanor. Not only does Eleanor agree, but Lawrence and Alison are pressured to leave by Clayton, as a result of Lawrence's divorce, leading to Sidney's promotion. Sidney works hard, writing to please others rather than to criticize, and earns several more promotions within a short time, as well as gaining access to the highest celebrities and most exclusive social gatherings. On the night before a prestigious film-awards ceremony, Sidney attends an informal party led by Sophie, and is pressured into surrendering his golden ring, which was a gift from his late mother. He regains his contempt for high society, and the next evening, as Sophie is approaching the stage to claim her award, he seizes her and takes back the ring, and also curses her, revealing that he was the one who killed her dog. In response, Sophie attacks Sidney, attracting negative attention and ruining his reputation. Nonetheless, Sidney, who has quit his job with Sharps, and feels a slight confusion concerning his life's direction, seeks out Alison, who by now has separated with Lawrence, and the two of them begin a relationship. Simon Pegg as Sidney Young, a British journalist. He is based on Toby Young as he is portrayed in the memoir. Kirsten Dunst as Alison Olsen, Young's colleague and eventual love interest. Megan Fox as Sophie Maes, a budding starlet and the object of Young's lust. Danny Huston as Lawrence Maddox, Young's direct boss. Gillian Anderson as Eleanor Johnson, the publicist pulling all the strings. Eleanor is loosely based on Nadine Johnson, a high powered publicist in New York City. Jeff Bridges as Clayton Harding, Young's magazine editor who is loosely based on Graydon Carter, the editor of Vanity Fair. Due to the subject matter of the film, a number of well known faces appear in archive footage, including Ricky Gervais, Kate Winslet, and Daniel Craig. How to Lose Friends & Alienate People is an independent film, and was described as "a testosterone-laced Devil Wears Prada." The film was produced by Number 9 Films. In 2006, Simon Pegg was announced as the lead, Kirsten Dunst was revealed to appear in the film in late April 2007, and in May 2007, Jeff Bridges and Gillian Anderson were added. Toby Young, who wrote the memoir, was banned from the set because he was constantly annoying the cast and crew. He does appear in the film though, with a brief cameo in the background of a party scene. Metro Station's song "Shake It" and Phantom Planet's song "Do The Panic" were used in the trailer. How to Lose Friends & Alienate People opened as one of the United Kingdom's number one films at the box office, taking the equivalent of US$7,055,425 during its run there. It took US$2,927,210 in Russia and US$1,963,356 in Australia. In the United States and Canada, the film grossed just US$2,778,242. The total worldwide gross was about US$19 million, 40% less than the production budget. The film received predominantly negative reviews. It currently holds a 37% "rotten" rating on Rotten Tomatoes, with the critical consensus, "A decent performance from Pegg in a disappointing film. Neither sharp nor satirical, Weide's adaptation relies too heavily on slapstick, and misses the point of the source material in the process." The Spectator called the film "fun," but noted that it "yaps around the ankles of its subject without ever moving in for a decent-sized, satisfying bite." On the other hand, The Sunday Times said the film "has more laughs than any British comedy to appear over the past decade." In the United States, Roger Ebert of the Chicago Sun-Times gave it 3½ out of 4 stars, calling it "possibly the best movie that could be made about Toby Young that isn't rated NC-17." ^ a b c McGee, Celia (14 October 2007). "Sweet Smell of Revenge (Screen Version)". nytimes.com. Retrieved 16 November 2007. ^ Landesman, Cosmo (5 October 2008). "How to Lose Friends & Alienate People". London: The Times. Retrieved 5 October 2008. ^ McCarthy, Todd (30 September 2008). "How to Lose Friends & Alienate People". Variety. Retrieved 29 October 2017. ^ "Simon Pegg Is Toby Young". empireonline.com. 18 September 2006. Retrieved 16 November 2007. ^ "Blonde On Blonde, Dunst joins Pegg for journo comedy..." empireonline.com. 23 April 2007. Retrieved 16 November 2007. ^ "Pegg Makes Friends, Big names join journo flick..." empireonline.com. 13 May 2007. Retrieved 16 November 2007. ^ Young, Toby (September 2008). "Why Kirsten Dunst banned me from the set of the film about my life". The Spectator. Retrieved 9 September 2016. ^ "How to Lose Friends & Alienate People". Rotten Tomatoes. Retrieved 14 January 2014.